Make your checkbook as classy as you are! 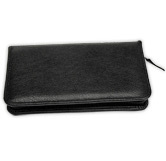 Choose this elegant design to add personalized sophistication to your personal finances. An eye-catching letter 'H' is covered in striking scrolls that swirl around the monogram. Any other letter of the alphabet is also available in this same style - from Allen to Zalinski! It's a subtle, yet eye-catching touch displayed on a basic beige background. Want to add a monogram to a particular style of personal checks? You can do that too! Look for the option during the personalization process when you check out. Order your very own H Monogram Checks from CheckAdvantage today! Add some matching address labels to make it all complete!